It is unlikely that two firms of professional accountants in this particular field would mishandle such a task, which leaves....? If the members were to be convinced that Psychic Press had been liquidated, what could be gained by that? Could such conviction lead, in turn, to open other doors to further lucrative activities? In honesty as a senior, very experienced and professional Finance manager I am bemused by what is going on. The Liquidator is appointed at the meeting of creditors which should be within 14 days of deciding to liquidate. They announced the decision on the 10th October and it is now 23 days and no liquidation process has commenced. By now the NEC, who appear to have taken over the role as directors, should have a full statement of affairs and detailed list of all creditors (well this should have been ready before the last creditors meeting was called off). All creditors have to be notified so that they can lodge proof of debt and arrange to either attend the meeting in person or appoint a proxy to vote for them. It appears no one, except the NEC, or possibly the intended liquidator, knows any more than the brief notice on the SNU web site. Normally their internal leaks would mean this would be common knowledge but apart from widespread knowledge of who the liquidator should be we hear nothing else. Now what is going on, are they truly astonishingly incompetent, which the evidence we have seen tends to suggest (backed by an arrogance of an assumption of how correctly they are behaving), are they poorly advised, which having used two firms of experts is unlikely but they may not be listening, or else are they attempting another cunning stunt of a kind I find it hard to comprehend. This latter possibility does seem the most likely, because they appear to have been, from what we have found out so far, so devious it seems unlikely a straightforward series of actions is possible. 23 days since they posted and now 6 working days since the first of my letters to the new Liquidator. Nothing back from any source, this is very difficult to understand. I wish that, when the liquidator had been mentioned, a creditor with a substantial debt, if there is one, had issued a Statement of Demand. We would have now only been about 14 days from that creditor forcing the liquidation removing matters from the owners hands. All of this must be costing a fair amount of money, which would presumably be recouped in the foreseeable future. If so, who and why and whose money is being used to fund this strange set of events. Will it eventually appear in the Accounts - or might that be academic after the coup? Speculation I know, but the SNU is based on the collective contributions of many people over a very long time now. True Hiorta and I very much doubt that any of those past contributors approve of the actions of this NEC. Surely when you take over the Presidency of an organisation like this you look back at its history and traditions and behave accordingly. I know in becoming leader of a Spiritualist organisation I try to. Luckily I get the chance to read the jottings in our ospiritualist organisation's founders copy of Rock of Truth by Sir Arthur Findlay. It reminds me of what they actually believed in and as the new leader the trust that I am left with. I think the SNU has ever been an organisation of many parts, why else would Maurice Barbanell never want to be involved in it. However, it has had some great people driving it, although I may feel some differences about who those people are and my views of the root cause of its current problems could be quite controversial.. I am reposting here a post by PublicEye which was in the Welcome section of the forum. I feel sure what is in the post will be of interest to many. Quote: "If SNU, plan to put Psychic Press (1995) Ltd into creditors voluntary liquidation, then why have the SNU registerd for the name to be trade marked on the 6TH of October 2010, Class 16, new application, certication mark, Publishers of newspaper and periodicals on the internet and hard copy magazine[printed. Also Psychic News Ltd, is not owned by Psychic Press (1995) Ltd, or SNU. It is a Private Limited Company in Scotland, that has nothing to do with SNU or Psychic Press (1995) Ltd."
I notice that my emails do not merit a reply. I am extremely concerned about events concerning this purported Liquidation, you have all received my earlier communications. This covers, especially the ownership of the masthead of the newspaper Psychic News and the Archives. Clearly the ownership of these, the only valuable assets of Psychic Press (1995) Ltd is still in dispute. There is a clear belief amongst the other Creditors that the Spiritualist National Union, the owners and possibly major creditors of Psychic Press (1995)Pty Ltd are manipulating events. “If SNU, plan to put Psychic Press (1995) Ltd into creditors voluntary liquidation, then why have the SNU registered for the name to be trade marked on the 6TH of October 2010, Class 16, new application, certification mark, Publishers of newspaper and periodicals on the internet and hard copy magazine[printed. As a creditor this attempt to place a key asset out of reach of creditors is an appalling act. I hope that at this time the CIB copied in to this will choose to act. This appears entirely in keeping with all of the other acts of this organisation. It appears that the liquidators are trying to establish whether the subscribers to PN, who have lost money from issues paid for in advance but not delivered, have a right to be Creditors. They are seeking legal advice on this, maybe it is because the Admin here irritated the previous Liquidator. Whatever occured the previous liquidator, a very well credentialled firm specialising in this field, accepted our claim and allowed the debt and the appointed proxy. It seems the NEC and its pet liquidator may be trying to reverse this situation now. Remember when we subscribed it was after the date that the NEC and the key Directors knew that Psychic Press was trading insolvently. Therefore they knew they would be unable to fulfill their legal commitments to provide the service we had paid for. This is one single subscriber, there were 4,000 even at that stage, many subscribed and paid for multiple issues to be onsold at their churches. On a scale of probabilities one quarter re-subscribed after the directors knew PP(1995) was insolvent. There could well be over 1,000 pounds of debt the NEC and Liquidators are trying to exclude. I suspect most of these fall in the same legal situation as those the NEC refunded money too, i.e the pre paid tickets to events, knowing it was an act that was probably illegal. Hmm, it does appear that the liquidators tried to contact me. They responded to Lis yesterday and sent copies of 3 emails thay had sent to me. I fear my email address must have the same aversion to correspondence received from this liquidator, as it had to the ones that Berley sent me. I will accept both of these parties word that these emails were sent but in both cases neither even made it to my Spam box. "Details of your claim have already been noted and will be dealt with subject to the outcome of legal enquiries as to the options available to the Company and its shareholders." This is passing strange as this is a Creditors liquidation so I fail to see what rights the "Company and its Shareholders" have. Of course it could be a double entendre based upon their potential right to take action upon my emails and this forum. However that would seem unlikely because it would bring all the matters listed into public view. We have been posting these as matters of public interest in an attempt to ensure that all issues are brought into a final resolution of this unhappy saga. Certainly we subscribed at a time when the President of the SNU, both the Chairman and Executive Director of PP, plus Andrew Hadley, the fourth working party member, had decided to recommend liquidation to the Board of PP. By that stage they should have known it would be an insolvent ending to the Company. It would be hard to understand how this would not be an amount which should be treated as a creditor. "The Spiritualists' National Union, as the majority shareholder of Psychic Press (1995) Limited, is concerned that the creditors’ voluntary liquidation of this company will result in creditors being unpaid. The Spiritualists' National Union is a separate legal entity from Psychic Press (1995) Limited and has no express power to provide assistance to Psychic Press (1995) Limited's creditors. I will add my comments on this latest move shortly. It appears the pressure may be telling, or else the risk to the directors, for their actions in running the company, are beginning to become more apparent. I note this because the second link shows that they may be considering trying to pay out creditors from within the SNU. I wonder just how much this debacle is really costing the SNU, now they are paying two liquidators, sought other professional advice and are getting legal advice. Oh and they have refunded ticket holders for various events that were cancelled by the closure of Psychic News already. This is very important because it appears the liquidator is not notifying subscribers who are owed money for undelivered issues of PN. This is pending legal advice but by the time that is received it will be too late to get the forms out before the Creditors Meeting so lodge these now. Equally we are aware Creditors, accepted in the previous aborted liquidation, have not been included on the list used to send out notifications. Therefore anyone who is owed anything from Psychic Press (1995) should also just fill these forms in immediately and lodge them by email. Lis wrote: The Directors are therefore making an application to the Charity Commission for authorisation to provide financial assistance to the creditors. The success of this application is not guaranteed and the outcome will be announced on this website in due course. This is very interesting, surely the SNU have been paying out already, for liquidators, for legal fees, for accounting fees and to refund ticket monies which had been taken and used within Psychic Press (1995). Would that not mean a breach had occured already in their duties. The other issue is, if the Directors had traded insolvently as the evidence surely indicates, why should the SNU cover these debts to creditors. This should be a personal liability of the Directors and the NEC who have clearly taken on a directoral role of late. It may appear that the NEC are trying to use the SNU trust funds to safeguard their personal position. Of course these matters require investigation which is why a full and independent Liquidation is necessary. By the way I say the evidence because they continued to purchase goods and accept subscriptions after the date that they had decided the Business must be Liquidated. I would hope that a number of SNU members will request that the costs involved in all of this are clearly identified as a specific item in the accounts. This would include all of the liquidators, accountants and legal advice cost. Any amounts repaid to ticket holders. Any amounts repaid to any other creditors for any item. Any amounts that they injected into PP to keep it going (including any money put in by the Arthur Findlay College (AFC). These are direct payments but what about any extraordinary purchases made by the SNU or the AFC that could have injected funds to keep PP going. For example did the AFC book shop buy an extraordinary volume of books in the period ? I know that they would eventually sell them but it would have been extra costs to teh SNU up front in this whole sorry and painful (especially to the staff) event. On top of that if the AFC college did buy books it would almost certainly be ones which PP never paid i.e. the company who supplied the books remained unpaid at the time of liquidation. Clearly approval for this would be at a senior level, so someone who would have been aware of all the circumstances too. So SNU members ask for a full costing and an explanation of the benefits the SNU will reap from hanging on to the Masthead and Archives. Then contrast this with the fact they would have received money for PP and seen the debt owed to them by PP repaid not as now being written off. The membership can then do a cost benefit analysis of their own, maybe up to 20,000 pounds received by selling PP versus the cost of retention which must already be over 20,000 pounds with experts costs. Quite probably 40,000 pounds to date and rising. Then consider the other events, the bad press the SNU has received over this affair, the ill will that has been created in the general Spiritualist community and the risk the SNU has been placed at. Risk, yes because unless the Staff are paid out the Government, once they have met the amounts due can come back and seek redress from the liquidator maybe even require a further investigation. The NEC must realise that the department that deals with the payments wil be fully apprised of what has transpired to date. I would think the Charities Commissioners may even ask some awkward questions as they realise that the NEC of the SNU was so active in running a company that met its end insolvently. Well the liquation of Psychic Press (1995) Ltd is going ahead and a Committee of Inspection has been appointed. As soon as possible a report of the Creditor's Meeting will be posted on this site. At a creditors meeting on Monday 15 November, it was agreed to liquidate Psychic Press (1995) Ltd and to appoint Marsh Hammond as liquidators. Claims totalling over £130,000 were included in the information made available to the meeting although these would be subject to confirmation. There were also updated accounts and an expanded history of events leading up to the meeting. This is expected to be posted on the SNU web site. Creditors included numerous psychic bodies and churches, employees (£33500) and the SNU (£40,000). It was noted that the Charity Commissioners had been asked to confirm that subscribers (£10,700) might be repaid by the SNU itself, although in general creditors would not be paid by the Union, because of charity law. A committee was appointed to assist the liquidator where necessary, consisting of an STF representative (Geoffrey Craggs was at the meeting, in the absence of Roy Stemman abroad); an SNU rep (to be decided) Susan Farrow and Leslie Price (both proxy reps of creditors). One other member was to be confirmed. 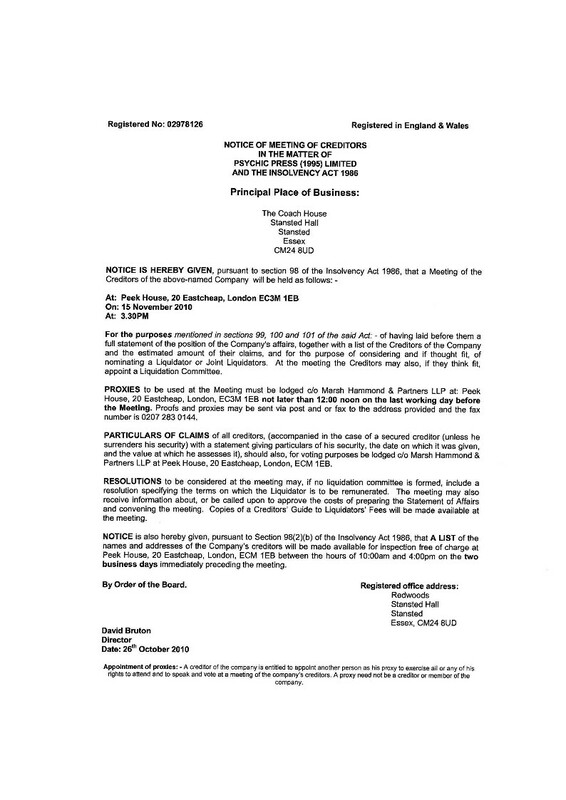 Susan Farrow reminded the liquidator of the latest offer by JV Trust to take over the business, and provided her with details of the disputed assets (the title and archives of PN etc). The liquidator began her enquiries immediately after the formal meeting. The SNU was represented at the meeting by David Bruton, Charles Coulston and Graham Hewitt. Susan Farrow was proxy for one of the creditors. I find it somewhat ironic that the word "haste" would be used in the last sentence about helping the paper's employees, who have been hung out to dry for how many months how? On a positive note, It does look like enough information has been provided and enough diversity on the committee to make things very uncomfortable for the SNU. Wes wrote: I find it somewhat ironic that the word "haste" would be used in the last sentence about helping the paper's employees, who have been hung out to dry for how many months how? I quite agree with your comment Wes regarding the irony of the word "haste" in the context of the long drawn out failure to place the employees in a position whereby they were appropriately paid reduncancy monies or enabled to claim from the Government scheme. As to your second remark - I only wish I could feel as positive. While there is representation on the inspection committee of the STF, and several other creditors (with a further creditor representative to be confirmed subject to the agreement of the creditor they held the proxy for) it is my understanding that there is unlikely to be any investigation into the possible trading while insolvent issue, or any investigation of the conduct of the directors of PP (1995) Ltd. The latter, may be due to alleged changes in the law in recent times which apparently are said to protect directors, however, I am not sure which legislation that is though will attempt to get clarification about it. It seems to me, that unless the SNU are willing to allow the JV Trust to purchase Psychic News (masthead and archives included) the SNU will have successfully destroyed PN (even if they intend to resurrect it in a new form as an in-house publication). While the SNU may succeed in legal terms, I truly believe that in the eyes of all genuine Spiritualists, who operate in accordance with spiritual, ethical and moral standards, the SNU be seen as having done a terrible thing, an action which has brought untold damage to the Spiritualist movement. Well I suppose we will know if the law has changed eventually. If it has, as a generality for all businesses, this is terrible as it allows people to build up debt whilst knowing the business is going to close insolvently and then escape liability possibly even retaining the assets of the business. If so it is a travesty of justice and it gives me great displeasure that the UK laws may have been changed to allow this, at this stage it would not be at all possible here in Australia. Oh well more questions to look for answers to. However, as Wes says the make up of the Creditors Committee is excellent, if any people can keep this Liquidation on the straight and narrow I am sure it is this group. It is also great that employees will at last be able to acces something even if, as I understand the UK Government Scheme, it will only be a fraction of what they are due for all their hard work. A new law did come in on company law 2009, but it did not efect, companys regiserd before that date, I will get the fact to you later, when I have time to wright the hole law up. Of particular interest is the information that as "a result of discussions that took place at that meeting, the following statement has been issued, under the heading 'Asset realisations':"